Xiom has always been known for providing the table tennis world with some of the highest quality rubber in the post speed glue era. Now, using the latest in rubber making technology, OMEGA V has been brought into the fold. OMEGA V Tour has the highest throw angle of the series. With high grip, spin, and a safe clearance over the net, it makes looping backspin close to the table and counterlooping topspin away its strong suits. I was looking for a replacement for Tenergy05 (as it's getting way too expensive); experimented with this Omega V Tour. As an 'average' club player, I found it was a great replacement. Was happy that I experimented. The TT11 staff has put this rubber on my FH twice now. It is fast and super spinny without losing control. It is balanced and durable. It is heavy, so I wouldn’t put it on a blade weighing more than 90 grams. Serving is super easy due to the medium dwell. The sponge feels medium hard and I love the sound of a well struck shot. Highly recommended. TT11, you are also highly recommend. Best service and TT company in the world. First time use, but fully satisfied. I will use again or try Omega 7. The rubber is hard and the catapult effect is extraordinary.The FH and BH Loop are executed with perfection. A good rubber for the aggressive player. I used to play with Tenergy 05 then 80 for almost 3 years. When I tried this one I like it a lot. It has more power more spin than my old two rubber. this one changes the whole game I'm more looper and offensive than ever. Very impressed with the spin and speed this produces and also great for blocking. Would recommend it. I would recommend this to anyone who prefers tensor rubber. very powerful rubbers with lot of spin. durable, powerful and easy to control. Produce low arch, serving is good. Lots of gear: looping, flat hit, blocking, pushing, all good. Will keep using this rubber for a while. Definitely worth a try if you want to change rubber. Switched to this rubber 5 months ago after a few years of playing with Xiom Omega IV Pro. Attacking strokes and serves felt right from the very beginning, while pushing and short game required some adjustment. Overall very happy of making this transition. Not for beginners! Due to my technique, I need the rubbers to produce arc; in order to be able to play. This one doesn't. Very good rubber, speed and control. Not impressive spin though. Fast,spinny, great outside and inside the table. 14/03/2016 GREAT rubber. Review by Cesar G.
Consistency. Xiom is really nailing it with its rubbers. GOOD spin, good speed; consistency guys. Try this rubber. Spiny with good control for serves, heavy pushes, and loops. Its blocks and short game are reliable for close to the table players. Versatile rubber that is suitable even for the Seemiller grip and the penhold grip. Best for bh max mm. Xiom is just high quality rubber u wont regret buying. Great control, great spin. My skills and techniques need to catch up to this rubber. Doesn't take much to generate spin on the ball. It feels roft,have a good control and speed,but spin is not enough.It very suit backhand. it worth to buy. We bought this rubber for a friend who loves to attack and I can see that his game has reached new heights. Very good rubber with all the ingredients for an aggressive game. 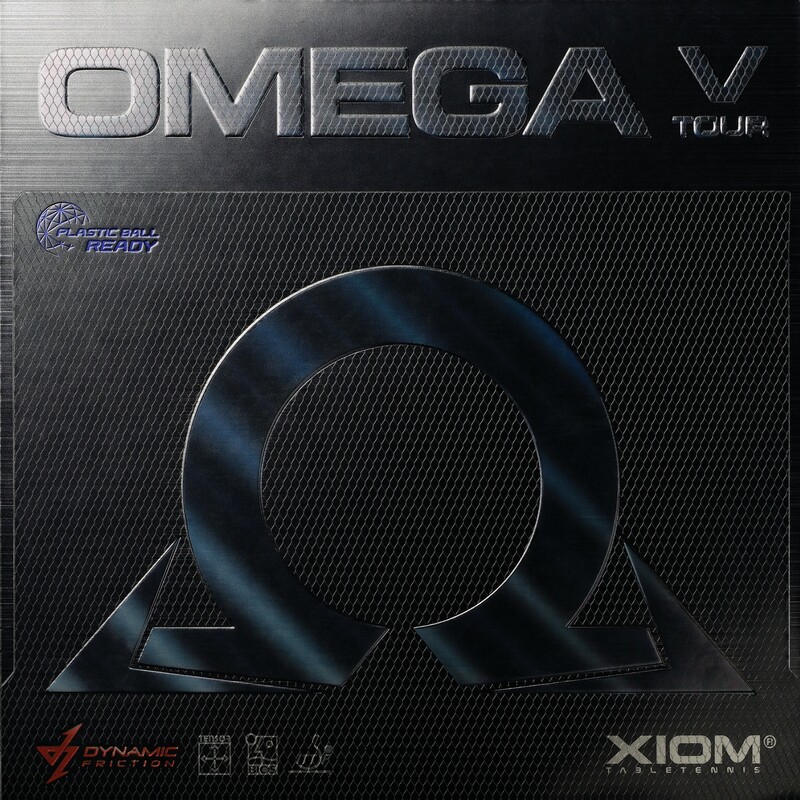 Xiom Omega V Tour is a very good offensive rubber, loop or smash, great for new balls. Have purchase XIOM rubber a few time from this supplier. Very satisifed with the quality and prices. I think this rubber is good for forhand better than backhand. It's very spiny and reasonable price. 188 g on blade 85g Yasaka Extra, so it's quite heavy. If extra weigh is not a problem great complect! Fast enough, great feeling and control, maximum gears, super spiny. Pure enjoy from game comparing to my previous friendship racket. Lower throw than Vega Pro with more grip and control. I use this on a Li Ping Kitex wood, which gives great control. This is a good and durable rubber, giving a lot of speed and spin. Quite hard, so I prefer it as a FH rubber. Play with Max red and 2.0 black. Very spinny; probably the spinniest Xiom rubber I have tested. Not too sensitive to opponent's spin. Slow in short game and lots of speed with faster strokes. Great for service, blocks, flat hit and spinnier shots. Can do everything with a lot of control. Great service from TT11 as well. Another great one by Xiom. Xiom rubbers are always nicely packed and of amazing quality. Omega Tour is no exception to this rule. Typical Xiom pack and look of a top sheet with some sheen to it. Spin: Honestly i was bit surprised in this area. When i hit the ball with the paddle i dont feel that rubber is all that spinney. After the ball bounces it is clear as day that it has MASSIVE spin on it. Also it is very easy to see from the trajectory. Maybe it is my hitting technique or something else, who knows. Relies from the distance are the order of the day and show spin potential to the fullest. For lesser experienced players it is very difficult to block or counter opening loops and a lot of time those blocks overshoot table. Speed: A bit faster then Sigma 2 Euro. Not too bouncy at all (some bounce but nothing to worry about). Trajectory is so long it is a bit nerve racking to watch the ball, but massive spin takes over and ball lands at the very edge of the table almost all the time. Probable next to Calibra or T64 this rubber has the longest trajectory i have seen. Other (angle, tack, hardness...): I dont totally agree with throw angle medium (as rated right now). In my opinion is more of a medium-high leaning on a high side of the spectrum. In terms of tackiness there is no tack what so ever. Grip 100%! Sponge and top sheet overall hardness appear to be medium-hard. Bit harder then Sigma 2 E. Personally i would love to have the exact same rubber just with harder feel to it. I still has that bit of a mushy feeling like all tensors but nothing like Vega Euro or T64 FX. In terms of control i dont agree with Xiom here at all (been the case for me lately), and i would rate this as relatively easy to control rubber. Only control issue i had is super long trajectory but not a problem in a sense, it was just making me bit nervous at the beginning (balls did land). Feeling is softer than omega v pro. Therefore, more control on looping. Sponge is quite rigid comparing with T05 so the ball goes faster in looping. Fast and control in high level. This is NOT a EURO or JAP kind of rubber. It is not springy/ catapulty. The topsheet is not as soft and elastic as tenergy. The rubber does not feel 'captive', the ball does not stay inside too long. You cannot use this rubber with hard blades, because there will be no dwell time. But with a medium blade like Stiga Infinity VPS the rubber has just enough grip and sink. The reason I gave it 5 stars is the neutral, linear power delivery and exceptional control. It is very intuitive and easy to use. Hit slow, it goes slow. Hit a lil faster, it goes a lil faster. It wont jump on you like tenergy. And yet if you make a powerful swing, it will shoot like a cannon. Not particularly spiny. Its just a neutral feel high control rubber. Throw is on the low side of medium. This is a high quality rubber with good spin, grip and excellent control. I bought this rubber from TT11 on Christmas got it only for $37. First let me thank TT1 for the excellent delivery and price too. The first topspin I played with this rubber I had a instant smile on my face so much punch with control and monstrous Spin. Guys this is the rubber I was looking for I am using 2.0 for my backhand and max on my forehand. This is value for every penny stuff go for it you wont be disappointed. I like rubber xiom OVT very good FH. I have bought a pair of Omega V Tour max and put them on my Xiom Ignito Blade. First thing remarked it was that I have to adjust the angle of my forehand, because Omega V Tour has a lower trajectory than my previous FH rubber (Nittaku Narucross GS Hard). The mix of spin and speed for these rubbers is just tremendous and fit perfectly a play close to table and mid distance (my case). I did not have any moment that the speed is to high and I can't control the shot. You can play very well a controlled lift a strong topspin. Very good rubbers also for blocks. If I have to compare Xiom Omega V Tour with Tenergy 05, I would say that the arch is lower for Xiom (but not much), speed is almost the same, control is better (is not so reacting to incoming spin like Tenergy). I would put it in the same league with Tenergy. The weight of rubber is 70 gr (squared) and 48 gr cutted to the blade, for max width (it's quite a heavy rubber). My setup is 180 gr. The conclusion is that these rubbers are top rubbers, at a fair price. 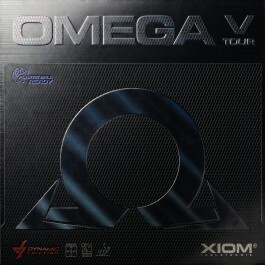 I have bought a pair of Xiom Omega V Tour max and put them on my Xiom Ignito Blade. Overall weight is 188 gr (the blade has 85 gr), so I think is not quite a light setup. Uncuted weights of rubbers were 70 gr for the red rubber and 68 gr for the black one (the thick is max). First impressions: the arch is lower than for Nittaku Narucross GS Hard (my previous FH rubber), so I has to open the angle for topspin. The ratio control/speed is fantastic. When you hit a strong topspin from a mid distance, it describes a very violent arch before to touch the table. You can play with it anything you want: strong topspin, controlled lift, is good even for the close to table push play. Serves are really spinnier with these rubber. Overall conclusion: is a top rubber, suitable mainly for close to table and mid distance play. But if you are a strong hitter, you can generate enogh speed also from 2 m away from the table. I like this rubber very much. For me, speed and spin are comparable as of Tenergy (with mention that the arch of Xiom is lower) , but the control is better for Omega V Tour. I have tested many rubbers over the last year and finally landed here. It is the best rubber on the market. It grips the ball better than tenergy, has a nice feel (not too hard, not too soft), just perfect. Could be a little cheaper, but with the discount offered by the shop, it is OK. It's very spiny and very controllable also . Is more flexible in the game and with my blade as jetro quad you can make your opponent wondering what improve so mutch, control ,power and spin with the same skills . My old rubber was sigma Europe 1 but this one is mutch more controllable and spinnier and "forgiven" in some way. Is also very good in service and in the receive of a service. But it shines in spin and in long rallies at medium and also long dinstance . I think finally that rubber make the difference for power users. Reading the marketing blurb, I was quite apprehensive as it seems to imply only the professional need apply. Well, I am no pro but I am most surprised by how good this rubber feel. Yes, it is fast and spinny. However, the top feel of this rubber gives me good control over my shots. I would put it as a Bluefire M1 but a bit softer and better control.